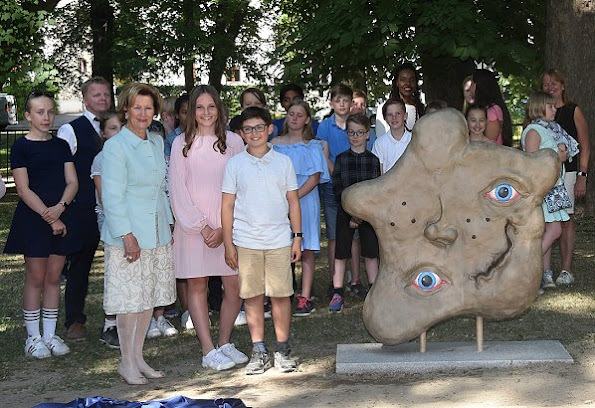 On June 7, 2018, Queen Sonja and Princess Ingrid Alexandra attended the unveiling of sculptures in the Princess Ingrid Alexandra's Sculpture Park in Oslo. 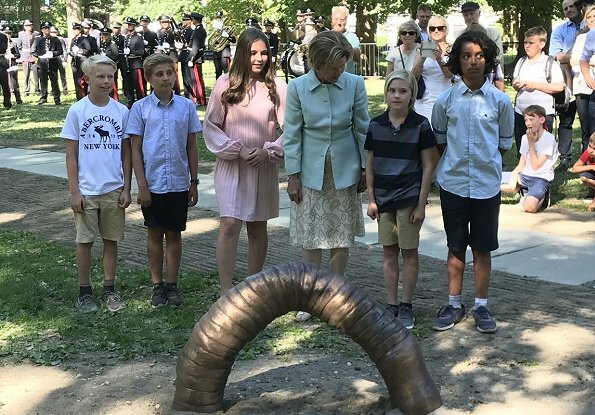 The sculptures are designed by and for children. The King opened Princess Ingrid Alexandra’s sculpture park in May 2016, as part of the 25th anniversary celebrations of the King and Queen. They're so adorable together, and appropriately dressed and coordinated. Love the princesses pink dress and her cute sneakers. I agree. They are very nice together. The look like very good friends. 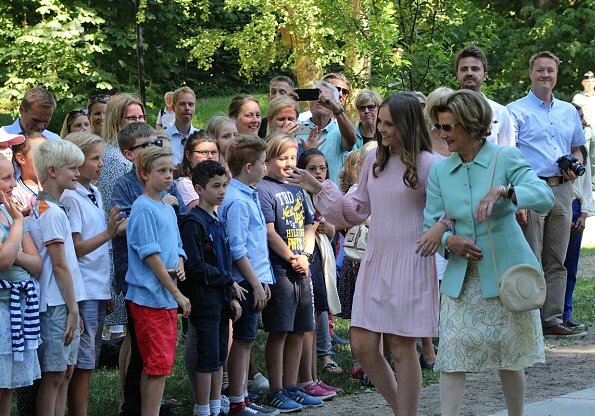 The pink dress suits princess Alexandra, and she is such a beautiful young princess. Princess Ingrid Alexandra has a cute dress on. I can see sensible sneakers as they are in a park. Now, this is what I like a modern day young princess to look like. Sweet dress and nice modern, sporty sneakers to go with it. Well done!!! What a lovely person is queen Sonja...everyone would want to have such a grandmother. Looks like Ingrid is very fond of her too. Love Ingrid Alexandra's pretty pastel dress! But -- unless she was running a footrace during this event -- I wish she had worn ballet flats. Wearing sneakers with a dress is very on trend right now. According to my podiatrist, ballet flats are the worst shoes you can wear, even worse than stilettos!! That shoes with this lovely dress :-D wonderful! Omg, the shoes , why not ballerinas? Everyone wears sneakers to dress right now. This is fashion. She looks fab! Anonymous at 3:12 AM, I agree that ballet flats would be much prettier with this delicate dress. Nice duo.The queen is always helping and guiding Pss Ingrid, she is already very good with representing the RF. Both outfits are lovely. Keep up the good work. What a lovely couple they are! Ingrid Alexandra is so modern and fresh, ballerinas for young girls are so out of date. So nice to see grandma with her grandchild-daughter! Princess Ingrid has a warm smile like her mother. I like her outfit so much - it is that what teenagers wore. Very good choice!! She is lovely. A beautiful blend of mother and father. She is growing so fast and has become so tall. She is a nutural beauty with a wonderful smile and very well dressed for a her age.Queen Sonja is lovely and well dressed too. What a perfect, modern outfit for a teeneage girl. She looks really lovely and the pale pink colour suits her tan. 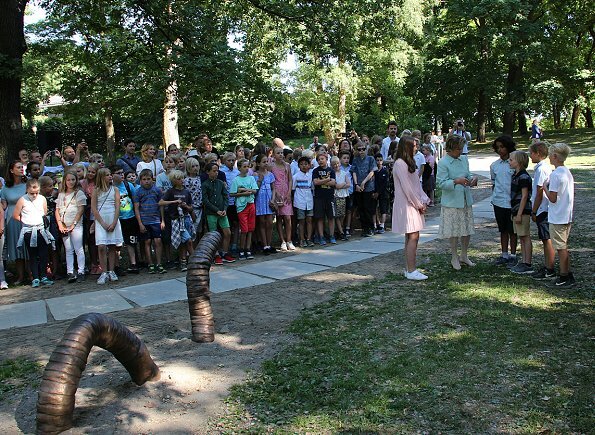 I know some might find it odd with sneakers to a dress and while I might not wear it myself it's very common here in Scandinavia with young girls right now. I don't judge, I remember wearing heavy boots with my summer dresses thinking I looked sooo cool, haha. 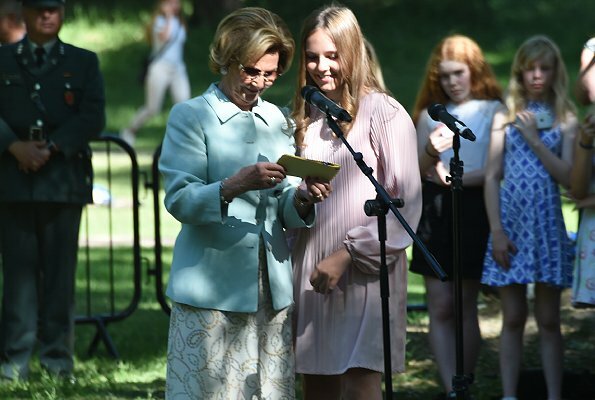 Yes, Princess Ingrid Alexandra has a lovely look for a girl her age. I wish that Lady Louise of Great Britain could wear such cute clothes, too. Another good example for teenage dressing is Crown Princess Elisabeth of Belgium. It is heart-warming to see grandmother Sonia guiding Ingrid into dealing with crowds, as well as Queen Elizabeth lending the new Duchess Meghan support. All to the good! Completely agreed. Queen Sonia looks like a great granny, decided to let her granddaughter be at ease. And I also find it unusual how overly formal Lady Louise is being dressed (I think it’s her mother, rather than Queen Elisabeth; Sophie is trying hard, maybe too hard, to keep their royal ‘status’ and make sure Louise isn’t turning into a Beatrice-like standout royal).